Treat yourself with Wild Planet Wild Albacore Tuna that helps to support your overall health and a better environment. With 600mg of EPA and DHA omega 3 in every serving, our canned tuna offers essential nutrition in every bite. Additionally, each can is full of fresh-from-the-sea flavor because we skip the added water, oil and fillers, so you can enjoy full tuna flavor in your favorite sandwich, salad or casserole. Our tuna is always gluten free, non-GMO and OU Kosher Pareve. -No added oil, water, or fillers - no need to drain the can! Harvested using only FAD-free fishing methods, Wild Planet supports wild tuna populations and habitats. Fishing fleets in the northern Pacific Ocean and in coastal New Zealand rely on pole and line methods to fish for albacore tuna. This ensures the preservation and support of local fish populations and their natural habitats. Wild Planet Foods is dedicated to maintaining the ocean’s natural ecosystem while sharing delicious, healthy and sustainable wild seafood. 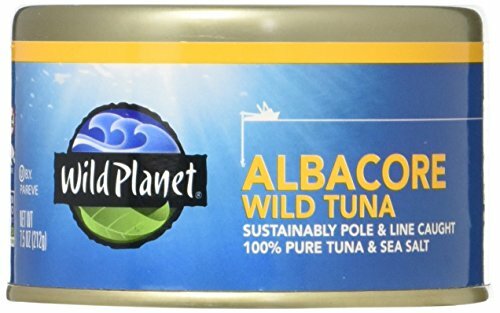 SUSTAINABLE WILD TUNA - Wild Planet's tuna is pole and line caught in the northern part of the Pacific Ocean or off coastal New Zealand, maintaining natural populations and preserving the ecosystem. ALWAYS NON-GMO - Gluten free, Non-GMO, and Kosher, our canned tuna is a convenient and healthy snack or addition to your favorite dishes. FAD-FREE TUNA - You can enjoy Wild Planet tuna with a clear conscious knowing that we rely on pole and line fishing methods that support local oceanic habitats and fish populations. NO ADDED OIL, WATER OR FILLERS - We leave out the fillers so that each can of albacore tuna is filled with the fresh-from-the-sea flavor that you want. If you have any questions about this product by Wild Planet, contact us by completing and submitting the form below. If you are looking for a specif part number, please include it with your message.